The thought of going on safari generally conjures up mental images of driving across the African savannah dressed in khaki and wearing a pith helmet while spotting elephants and lions. But did you know that it is possible to get a true safari experience in North America, without having to endure a very long trans-Atlantic flight? Luxury travel company The Clear Creek Group is now offering the Wolf and Bear Expedition, which promises to take adventurous travelers into Yellowstone and Grand Teton National Parks in search of the two legendary predators. The three-day trip pairs visitors with a wildlife biologist who then guides them into the the famous Lamar and Hayden Valleys, which are often referred to as “the Serengeti of North America.” Those two destinations feature an incredible amount of wildlife, including bison, moose, elk and more, set against a dramatic backdrop of sprawling and beautiful landscapes. The Wolf and Bear Expedition begins and ends in Jackson Hole, Wyoming, but while on safari, travelers will stay in the wonderfully quirky Montana town of Cooke City. Accommodations are included as part of the package, as are side visits to Old Faithful, the spectacular Grand Canyon of Yellowstone and the terraces of Mammoth Hot Springs. Of course, the real highlight of the trip is the wildlife, which will take center stage thanks to the expert guides on these trips. They’ll know how to locate the predators in the wild and they’ll give travelers an opportunity to observe them in their natural settings. Having visited Lamar Valley myself, I can tell you that it truly is a magical setting. I’ve seen the wildlife there and it is quite the experience. While I was there, I spotted a large moose, a pack of wolves and numerous elk and bison. Sadly, I didn’t get the chance to see a bear, although on this excursion it sounds like that is more likely to happen. The four-night itinerary for the Wolf and Bear Expedition is packed top-to-bottom with activities for a very busy few days. Prices start at $3675 with bookings available in May, June, September and October. Visitors to the Grand Tetons National Park visitor center got a very unpleasant surprise recently when a can of bear spray was inadvertently discharged inside the building. The incident prompted an immediate evacuation of the entire facility, as the potent pepper spray soon spread throughout the center. Apparently, one of the park’s rangers was preparing for a morning program in the visitor center’s auditorium when a man entered the room and quickly grabbed a seat without first taking a look at the chair. In doing so, he sat down directly on the can of bear spray, releasing its contents throughout the room, and sending the occupants scrambling for the emergency exits. The powerful chemical didn’t stay contained to the auditorium for long however, as the ventilation system soon pumped it throughout the rest of the building. By the time an emergency response team arrived on scene, more than 20 people were suffering side effects from exposure to the pepper spray. 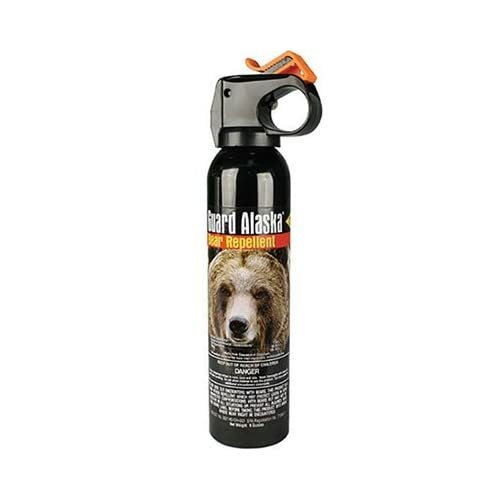 Bear spray is an incredibly potent version of the same pepper spray that is commonly used by police or for self defense by individuals. In this case however, it has to be strong enough to take down a 500 pound bear rather than a 200 pound person. The spray is actually an oil that is blasted out via an aerosol, and when this particular can went off inside the visitor center, it not only spread throughout the facility, itended up contaminating merchandise in the gift shop, including t-shirts and stuffed animals. Anyone who has done any hiking in the American west knows that bears are a potential danger, particularly in national parks such as the Grand Tetons or Yellowstone. In many places, bear spray is actually mandatory gear before heading into the backcountry, and the ranger in this story was likely preparing to instruct visitors on its use. Unfortunately, they received first hand experience in just how powerful the spray actually is in a way that is usually only reserved for the bears. Back in early January we posted our suggestions for the best adventure travel destinations for 2011, with places like Ethiopia, Croatia, and Guyana all earning a nod. While we gave plenty of praise to those exotic locales, we also gave a big tip of the hat to the good ole’ U.S. of A. as well. We went on to espouse the virtues of adventure travel right here at home, which includes not only plenty of great destinations but also the ability to visit them without breaking the bank in the process. So, whether you’re into climbing mountains, hiking trails, or paddling whitewater, here are five great domestic adventure destinations guaranteed to fill your need for an adrenaline rush and help you conquer that wanderlust in the process. It may be hard to believe, but the state of Michigan is actually home to a spectacular wilderness area that has a lot to offer the adventure traveler. The Upper Peninsula, or “U.P.” as it is known, is the perfect setting for outdoor enthusiasts year round. There are hundreds of miles of trails to be hiked or biked in the warmer months and during the winter they serve as excellent cross country skiing or dog sledding routes as well. Paddlers will enjoy the Lake Superior coastline, which offers an experience not unlike sea kayaking, while campers and backpackers will appreciate the dense, but beautiful, state and national forests that are found throughout the area. Wildlife is in abundance as well, with black bear, deer, wolves, coyotes, and many other creatures inhabiting the wilderness as well. Perhaps the best reason to visit the U.P. however is for the solitude. The peninsula makes up about 1/3 of the entire size of the state of Michigan, but only about 3% of the state’s total population actually lives there, which means there are plenty of wild spaces and few people to bump into on the trail. One of the most spectacular outdoor playgrounds in the entire world is located right in central California. Yosemite National Park is well known for its spectacular scenery that features towering granite cliffs, sparkling clear waterfalls and streams, and thick forests that include groves of Sequoia trees. The park has more than 750 miles of hiking trails alone and whitewater rafting along the Merced River is also a popular summer time activity. In the winter months skiing, both downhill and cross country, are permitted within the parks boundaries, and snowshoeing is a fantastic way to explore the wilderness as well. Yosemite also happens to be home to some of the best rock climbing in the world, with the legendary El Capitan drawing climbers from across the planet. That rock face isn’t for beginners however, and if you’d prefer an easier way to the top, you might want to consider hiking up Half Dome, another one of the parks major attractions, instead. Often overshadowed by other national parks in the area, Wyoming’s Grand Tetons National Park is a spectacular destination in its own right. With more than 200 miles of hiking trails, it is an ideal destination for backpackers. But less experienced hikers beware, due to its combination of remote backcountry and altitude, it can be a challenging place to explore. The park also happens to be bisected by the Snake River, which provides world-class fly fishing opportunities and easy kayaking as well. Mountaineers love the remote nature of the Teton Mountains, which afford them real opportunities to test their alpine skills on any number of challenging peaks, including the 13,770-foot Grand Teton itself. The park has plenty to offer wildlife spotters too. While visiting, keep your eyes peeled for moose, grizzly bear, wolves, coyotes and much much more. For considerably easier, but no less satisfying, mountains to climb, look no further than Maine’s North Woods. The region is a dramatic, and mostly untouched, wilderness that is a fantastic destination for hikers and backwoods campers, offering thick forests and plenty of low altitude (read 2000-3000 feet) peaks to bag. As you can imagine, wildlife is in abundance here as well, with moose and black bear making regular appearances, along with otter, deer, and even bobcats. Paddlers can choose to enjoy a serene day in a canoe on one of the many lakes that dot the area or elect to head over to Maine’s Atlantic Coast for a decidedly different, and more challenging, experience in a sea kayak. With over 3.5 million acres of forest spread out across northern Maine, there is plenty of backcountry to explore. Located in New Mexico’s Sangre de Cristo Mountain region, Taos is one of those towns that sits at the epicenter of an outdoor enthusiasts’ paradise. In the winter, it is one of the best ski and snowboard destinations in the entire country, and the miles of local trails are fantastic to explore while snowshoeing as well. During the summer, those same trails make Taos a world-class mountain biking destination and rock climbers will love the variety of challenges they find in the nearby mountains too. The warmer weather also brings excellent whitewater rafting, as well as fantastic opportunities for horseback riding, hiking, and trail running through a pristine wilderness that never fails to surprise visitors with its beauty and wonder. The village of Taos is a great destination in its own right, enchanting travelers with its down home charm, and it serves as a prefect base camp for those who come to play in the backcountry. There you have it. Five great domestic destinations to that will give you plenty to see and do no matter what time of the year you visit. It’s still plenty early in 2011 to start planning your own escape to one of these outdoor paradises. I dashed off to Jackson Hole for a few days not too long ago. Driven by the need to unwind for a bit and a decade-long desire to visit the setting of some of my favorite novels (by Tim Sandlin), I set my sights on the Grand Tetons and didn’t look back. What I found upon my arrival at the Jackson Lake Lodge, one of the three hotels in the area run by the Grand Teton Lodge Company, was an unexpected culinary experience that capture me from the moment I saw the menu. The mid-tier offering of the Grand Teton Lodge Company – with Jenny Lake Lodge at the upper end and Colter Bay Village the bargain offer – the Jackson Lake Lodge has spacious and comfortable rooms, though they are of course consistent with the price point. This is what made the property’s high-end restaurant, Mural Room, particularly exciting: it was an inspired and local menu at an affordable hotel. Normally, mid-range hotels deliver solid, reliable, basic fare, with a decent steak constituting the top end of the menu and the rest of it being rather pedestrian. Mural Room stands that thinking on its head, with an exciting menu that blends creativity, local favorites and ol’ reliable dishes that you’d expect to be on hand for those who aren’t terribly adventurous. Of course, the local touches on the Mural Room menu are not surprising. When bread is served, it comes in the shape of a carefully sculpted moose – not my scene, but I do understand the appeal in general. Instead, I was drawn to the menu items that took advantage of the area’s local fare, such as hazelnut and ginger buffalo carpaccio and southwest and molasses spiced elk loin. Whether you go for the unique local stuff or stick to the standby dishes (like the prime rib), you’ll walk away satisfied, as the chef clearly has his act together. What really blew my mind wasn’t the local ingredients or even the entrees. Rather, it was the lobster and brie bisque. Served with chunks of lobster and a creamy soup around it, the dish was an unexpected seafood delight far away from the place these crustaceans call home. The price points were a bit high for the Jackson Lake Lodge: the restaurant offered entrees at close to $30 or more (in most cases) in the company’s mid-level property. That said, there’s always room to splurge while on vacation, and a bargain vacation often has room for a fantastic meal that defines the trip’s culinary experience. Mural Room delivers this experience – to the point where you’ll probably want to make reservations a week before you arrive. My trip to Jackson Hole was long anticipated, which of course led to unnecessarily high standards. Mural Room delivered, becoming the defining moment of my trip. Some properties have a culinary surprise buried deep in the website – this is one of them. The best part of all-inclusive trips is that the thinking is taken out of the equation. Want a second drink? Hell, a second entrée? Go for it! There’s no reason not to … because the bill is already paid. I had my first brush with the all-inclusive concept last summer, and I’m sold on it, especially since I get impatient while waiting for the bill (when the meal’s over, I just want to get on with my life). So, I was pretty excited to see a handful of all-inclusive deals come across my desk or this summer. So, take a look below at what’s coming at Vail Resorts, Curtain Bluff and Grand Teton National Park in the next few months. You’ll probably find a vacation idea to turn you on and make the coming warmth even better! Head out to Colorado for this family-oriented package. Everything is covered, from airport pickup to drop-off, with plenty of activities to keep you and the kids busy. You’ll also have access to a guide who can show you the best rivers to raft, trails to hike and so on. At $249 a day for adults, you’ll pick up a savings of more than 38 percent … and you won’t have to cobble together the itinerary yourself. If you prefer peace and quiet – not to mention being enveloped by nature – check out Grand Teton National Park in Wyoming. The Grand Adventure Package includes accommodations at Jackson Lake Lodge, a rafting trip on the Snake River and hiking through Grand Teton National Park. You’ll also receive all meals and even more activities, depending on how long your stay is. A four-night package starts at $1,902 for two adults and two kids, with seven nights starting at $3,806. Curtain Bluff is an all-inclusive resort, but the deal for the summer can be found in the rate. For a mere $322.50 a night (and up), you can go deep-sea fishing, reef snorkeling or SCUBA diving, among other activities. I’m a big fan of the spa – and the restaurant, skippered by an Alain Ducasse-trained chef.